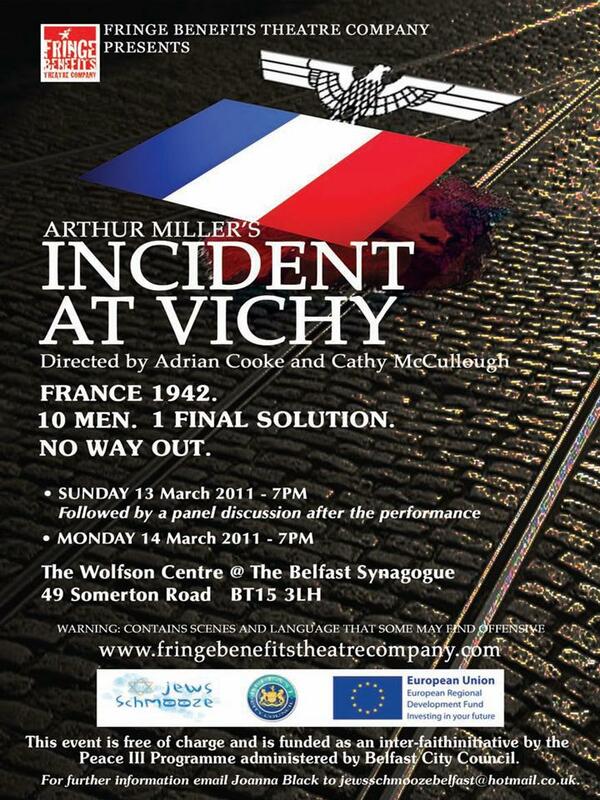 Last night I had the privilege of attending performance of Arthur Miller's "Incident at Vichy" in the Belfast Synagogue as part of the 2011 Jews Schmooze Arts Festival. I begged (and beg) to differ... all that I have read of pre-war Germany, and the critique of religious belief and action then by divergent voices such as Barth, Bonhoeffer, Niebuhr and Niemoller, suggests a society pervaded by religious belief... More theological reflection went on in German universities in the 50 years prior to WW2 than perhaps at any other time in church/academic history... but that was rarified academic theology that had little impact on the man in the street. There, the prevailing religious belief was one that was entirely compatible and indeed comfortable with anti-semitism and other racist and nationalist ideologies... be it the intensely anti-semitic Catholicism of Bavaria and Austria, or the Lutheranism that hadn't shaken off the anti-semitism of the reformation as exemplified and indeed reinforced by some of Martin Luther's own writings. The issue is not a belief in God... but the kind of God you believe in, and whether that belief makes any difference to how you live your life. Here in Northern Ireland, and North Belfast is as good an example of that as any, the God worshipped, or at least the way he was worshipped, was one of the factors in the ongoing victimisation of one community by another. Belief in God has been cited as one of the factors that limited the extent of the violence, but religious belief was indubitubly one of the factors that caused the violence in the first place especially when sectarian attitudes and nationalist idolatries etc were not only permitted, but at times promoted by faith leaders. Fine thoughts and feelings are great, but as Leduc makes clear to the (up to that point) sympathetic German officer, feelings mean nothing if they don't move the officer to save those in danger. But don't just watch and listen and chat to your friends about the issues raised afterwards, rather ask yourself "What do I do now?" 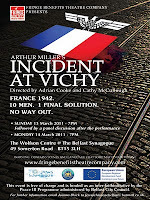 I have just found this review, I am glad you enjoyed the play and my performance. Hopefully I will see you at future performances and be able to have a talk with you afterwards.